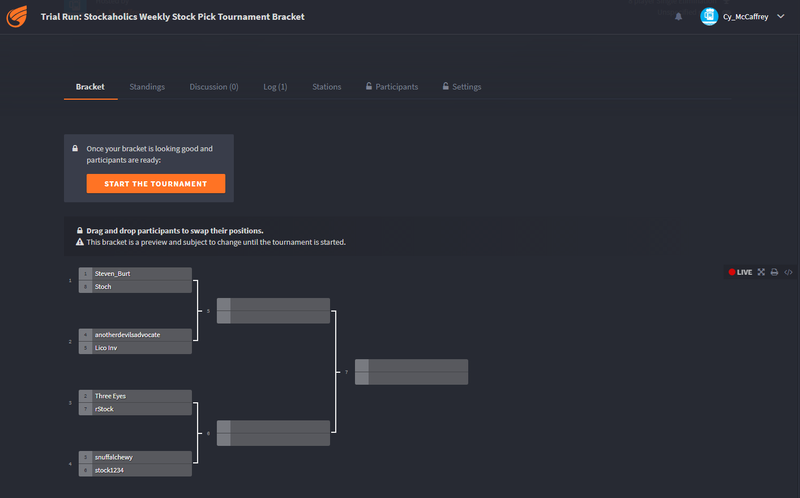 After we're done trial running this team challenge playoff series, I'm gonna try running a weekly tournament bracket challenge next. I believe this one was what @rStock was looking for last year, but I never managed to run it because I got real busy at the end of last year. Basically this new tournament idea would be a 1 vs. 1 challenge, as opposed to 2 vs. 2 like this team challenge. To get an idea exactly what I mean, below is a sample bracket I created with the same usernames who are currently participating in this team challenge. I'm still undecided on exactly the format I'll end up running this. Right now I'm thinking of making this a best of 3 series, with whoever wins the first 2 against their opponent would advance to the next round. We'll see, but anyway here's an actual bracket of how this come out. Lico Inv and Steven_Burt like this.